NOD it is a nonprofit organization and does not receive any public funding, Nod economic capacity depends only and exclusively by student fees and contributions from private enterprises who love dance as education. - Gaga and Naharin Repertory (1 day) € 45,00 + m.r. - Gaga and Naharin Repertory (3 days) € 135,00 + m.r. - Gaga and Naharin Repertory (4 days) € 175,00 + r.m. - Gaga and Naharin REpertory (5 days) € 200,00 + r.m. started his dance training as a member of local companies including Hora Jerusalem and the Jerusalem Tap Dance Company, and he received several Sharett scholarships from the America-Israel Cultural Foundation as well as a grant from the Ministry of Culture and Education. 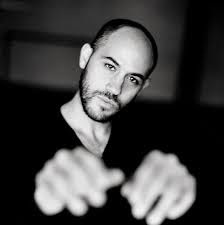 A graduate of the Jerusalem Academy of Music and Dance’s high school, he joined the Batsheva Ensemble in 2002 and danced with Batsheva Dance Company from 2005-2012. At Batsheva, he performed in repertory by Ohad Naharin, Sharon Eyal, and Yasmeen Godder and premiered his own choreography in several Batsheva Dancers Create programs. 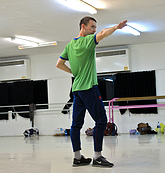 Erez began teaching Gaga in 2003 and has taught throughout Israel and around the world. He is currently an independent dancer and creator as well as a certified therapist in the Ilan Lev method. Erez is also the co-artistic director of the Bye Bye Ballet school for contemporary dance in St. Petersburg, Russia. Gaga is the movement language developed by Ohad Naharin throughout his work as a choreographer and Artistic Director of Batsheva Dance Company. Gaga has two tracks: Gaga/dancers, which is the daily training of Batsheva Dance Company members, now taught also for other dancers in Israel and abroad; and Gaga/people, open to the public and available for anyone at any age, without the necessity of previous experience. Gaga classes are held for a growing number of people in the Suzanne Dellal Centre and at additional places in the country and abroad. Ohad Naharin creates the Gaga technique, a method that allows to increase the body's flexibility, strength and agility activating the senses and the imagination. The choreographer, after his back injury, is forced to change his daily training and that of his dancers, so to do this he invented a different form of dance based on the research of the most intimate and deep emotions that the body's movement can give and based on following this urge that come from the body. This new body expression does not require to those who experience it, to erase what has been learned before, but requires them to discover new ways of representing it better, new forms that are already part of everyone's body. The Gaga technique in fact teaches how to measure out properly your strength, how to “use” other people strengths and how to protect muscles and joints. It teaches you to feel the energy flowing through your body in every direction, leading you to acquire more knowledge and self-awareness and to improve instinctive movement. Every Gaga lesson does not foresee breaks or exercises, but a continuous flow of instructions, one after the other. The new directions don't cancel out the previous ones but they join them, layer by layer. NUOVA OFFICINA DELLA DANZA A.s.d. If by reason of Act of God, beyond the control of either party, the workshop/s set out above are cancelled, exclusively for reasons attributable to the organization, it is the obligation of the organization itself, repay the entire amount paid for participation. Se per qualsiasi motivo indipendente dalla volontà non fosse possibile effettuare gli stages o master class previste, solo ed esclusivamente per motivazioni imputabili all’organizzazione, è obbligo dell’organizzazione stessa, restituire l’intera somma di partecipazione versata. Barak Marshalls works - Monger, Rooster, Wonderland and 1972.
born in 1978. At age of 18 started to dance with the "young Kibbutz Company" where she worked with the choreographer's Rami Be'er and Imbal Pinto. In the years 1997-1998, danced in "Barak Marshall project": Between 1998-2005 wa part of the "Batsheva Dance Company", where she worked with Ohad Naharin, Matz Ek, Paul Norton and Sharon Eyal, among others. Since 2005 she is working as an independent dancer in different project with choreogrphers such as Jasmeen Godder, Ronit Ziv, Renana Raz, NOa Shadur, Hillel Kogen, Dana Ruttenberg, Roy Assaf,Barak Marshall and many more. 4 years ago, she became Barak Marshall's Assistant (the artistic director of the Imbal Dance Company)and since then she is teaching his creations around the world and directing the rehearsals of his company. Se per qualsiasi ragione il workshop subisse cambiamenti o cancellazioni, ci saranno rimborsisolo ed esclusivamente per ragioni imputabili all'organizzazione stessa. Se l'associato cancella la propria partecipazione, ci dispiace ma Nuova Officina della danza non potrà effettuare nessun rimborso, neanche parziale. HOFESH SHECHTER COMPANY IN PROGRAMMAZIONE - LUGLIO 2014!